As the United States experiences an overwhelming opioid crisis; as the world’s press is flooded with extra-judicial killings targeting drug “offenders” in the Philippines; as young Australians overdose on novel psychoactive substances and teenagers in the UK on ecstasy, there can be only one certainty: drugs are here to stay. Despite some countries reaffirming farcical commitments to a drug-free world, with over $100bn spent annually on the War on Drugs, and 20% of the world’s prison population incarcerated on drug offences, drugs have never been cheaper or purer. Enter harm reduction – the concession that as drugs have been indelibly woven into the fabric of society, there should exist means to reduce their adverse health, social and economic consequences, independent of reducing their consumption. Drug testing is but one facet of harm reduction which enables users to shine light on unknown harms and then make an informed, or at least less arbitrary, decision on whether to consume or discard. Drug testing can broadly be divided into three categories: test kits; on-site testing at clubs and music festivals; and ‘send-away’ testing to a professional laboratory. 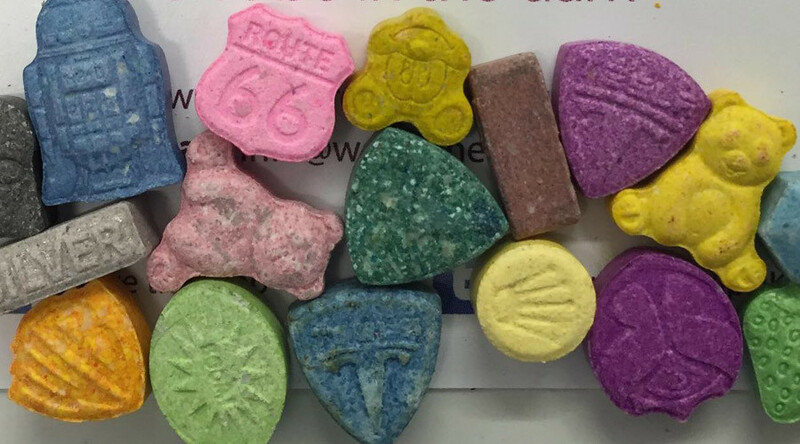 To be succinct, this article will focus on ecstasy pills (MDMA) in Europe. Test kits are vials of chemical reagent which change colour in the presence of a drug. The testing method is simple enough - a drop of reagent is added to a small sample of drug (a pill scraping or a few milligrams of powder). Then, much like a school chemistry experiment, a colour change occurs. So that’s it, problem solved? Not exactly. For any given reagent, no single drug produces a unique colour. Rather, the reagent reacts with a specific structural motif within the molecule. 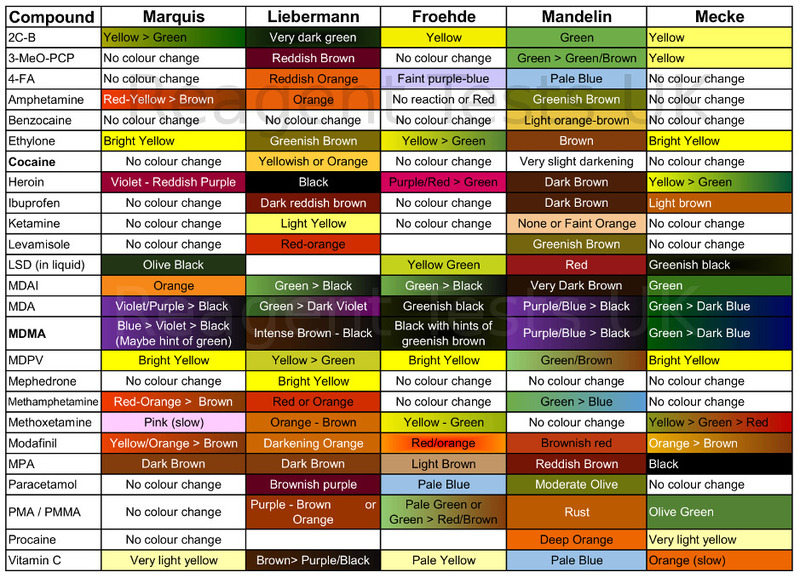 These motifs are often shared between drugs, leading to a wide range of colours and reactivity and considerable overlap (in practice, the colours are even harder to discriminate). To distinguish MDMA confidently from its analogues and imitators requires three tests in sequence, each eliminating uncertainty from the last, yet can still fail to identify low-dose, highly toxic ingredients. Attempting to discriminate between practically identical colours, potentially the difference between dancing until the early hours and intensive care, cannot, and should not, be done in the corner of a nightclub toilet. I contacted Dr John Ramsey, director of TICTAC, for his thoughts, “Colour tests may give a nice colour, but that's it: no information on quantity and unreliable information on composition … They are only indicative at best”. Dr Mireia Ventura, drug checking coordinator at Energy Control, agrees, “With PMA/PMMA and the emergence of new psychoactive substances [‘legal highs’] as adulterants, colourimetric tests are not enough and a positive result could generate a false security.” The total lack of information on quantity is of particular concern: across Europe, ecstasy pills are increasing in both purity and dose. At present, high-dose pills, rather than adulteration, seem to cause the majority of hospitalisations. Drug markets, however, are highly region specific. Most the world’s MDMA is made in the Netherlands and Belgium, while supply outside Europe is much scarcer. Accordingly, in the USA, as Mitchell Gomez of DanceSafeexplained to me, the issue is misrepresentation, rather than adulteration (i.e. things sold as MDMA rather than added to) so that colourimetric tests remain reliable. In 15 years of laboratory testing, only three samples containing PMA/PMMA have been documented in the USA. Several European countries have had forward-looking, public health-centred drug policies for several years, permitting the formation of ‘send-away’ drug testing programmes – now both well-established and popular. I contacted Drug Information and Monitoring Service (DIMS) (The Netherlands, established 1992), Energy Control (Spain, established 1997) and SaferParty (Switzerland, established 2001) to gain a better understanding of the environment surrounding testing. I rapidly realised that I was asking somewhat primitive questions from the perspective of a British citizen, from a country which has chosen to cling to backward, tired and ineffectual rhetoric. Probing issues of relationships with the police, transport of drugs by post, and immunity of testees from prosecution, the answers were clear and simple. Dr Tibor Brunt explained that DIMS “have a special agreement with the public prosecution office that they do not interfere with [our] work”; the agreement extends to registered and signed parcels to permit the movement of illicit drugs by post. For Energy Control, the situation is simpler still: the quantities received by post are so small that they are considered for research purposes and need no further legislative changes. Christian Kobel of SaferParty says that though legislation surrounding testing “is not completely clear”, harm reduction is one of the four pillars of the Swiss Narcotics Act and Swiss states have an obligation to provide “harm reduction and survival support measures”. SaferParty’s relationship with the police is crystal clear: they meet to discuss best practice, provide statistics on tested drugs, and discuss emerging drug trends such as the darkweb. In 15 years, there has been no police intervention on any drug-checking site, whether mobile or static. In countries where testing services operate without sanction from regional or centralised Government, on-site services (i.e. at music festivals or clubs) are easier to set up, ‘only’ requiring support (or at least tolerance) from local law enforcement. These services, whilst lacking a full laboratory, use portable analysis devices, often in combination with colourimetric testing, to give highly accurate results. Prof. Fiona Measham, co-director of The Loop, the charity behind the first on-site drug testing in the UK, explained to me that “testing operates with the full support of local police and [we] work very closely together from the start. The Police want the testing, they don’t just tolerate it”. Though national governments are often sluggish beasts, beholden to voters and wary of scandal, local law enforcement is able to work with forward-looking initiatives, bringing effective policy to the front-line much more rapidly than top-down policy. Measham notes that the UK Government is not openly opposed to testing nor to local police forces electing to ‘deprioritise’ cannabis possession, rather they are “watching and waiting for the evaluation”. Whereas The Loop operates in close cooperation with the law, DanceSafe benefits from the police turning a blind eye: “law enforcement has very little interest in low level possession arrests, and in all the years we have been testing we've never had a volunteer or a testee arrested. In most [US] states needles are 'paraphernalia', and setting up outside a needle exchange would be an easy way to make arrests, but the police understand this is counterproductive to their ultimate goals.” Some comfort may be found in a remark from Prof. Michel Kazatchkine of the Global Commission on Drug Policy: “decriminalisation and regulation must start at the local, city, subregional level”. Harm reduction, now central to many national drug policies, started this way - perhaps so too will drug testing. The numbers speak for themselves – no one at SaferParty can recall an ecstasy-related death, despite Zurich’s love for raves and techno; at The Loop’s first UK music festival, 25% of people discarded their tested drugs; and DanceSafe’s anecdotal evidence suggests that discard rates of misrepresented MDMA approach 100%. The benefit reaped from drug testing services goes considerably above and beyond offering information to an individual user about an individual drug sample. In Europe, most of the drugs tested are ecstasy pills which can easily be distinguished due to their colour, shape and patterning. Upon detection of toxic contaminants or a particularly high dose, early warning systems can be utilised to disseminate information rapidly and effectively. Shortly before Christmas 2014, DIMS detected lethal quantities of PMA in a pill and released a ‘red alert’. The alert was circulated on national television, on screens in clubs and through the dedicated mobile app. No one died. Not so in the UK. The same pills killed 4 people over the festive period. The same pills resurfaced in October 2016 and, as these were recognised by users, there were no further casualties. Though there exists an EU-wide Early Warning System which monitors emergence of new psychoactive substances and provides risk assessments for them, it cannot, neither is it intended to, respond to the highly dynamic drug market on a local level. As part of a balanced, public-health driven drug policy, countries should offer official, local early warning systems to monitor variability between batches of existing drugs whose composition can fluctuate on a week-by-week or town-by-town basis. Failure to provide these systems has been, and will continue to be, a fatal decision. The illicit drug market is free from any official quality control, and users are at the mercy of suppliers. This creates a profound case of asymmetric information between suppliers and users, permitting drug supply of any composition to clueless, hapless buyers. Drug testing offers a form of pharmacovigilance, providing a method by which users can exert some control over an entirely unregulated market. The Trans European Drug Information project note that “manufacturers will be less inclined to trade in dangerous substances or adulterants if they know that there is a way for consumers to test their product … if dangerous substances can be identified via a warning campaign, traders are more inclined to rapidly withdraw their products from the market”. Drug testing, therefore, acts not only as a personal harm reduction initiative but has the capacity to shape the very composition of the market itself.